About 30min west of Launceston is Quamby Estate at Hagley. Luxury accommodation with it’s own golf course – and is incidentally also the base for the Cradle Mountain Huts and Bay of Fires walks, which is how we discovered this place. Doing a second, shorter walk with them was the excuse to go back again! The first time I stayed there (Oct 2008) they had only just opened (that week, I believe) and everything was just coming together. A year later they had restored more rooms and had everything down pat and running perfectly. It’s a wonderful, warm country homestead set in the rolling hills and fields that remind me of picturesque English countryside (rightly or wrongly – I’ve never been to the UK). Not all walkers choose to stay at the Estate – they also send a bus in to Launceston to pick people up from Peppers Seaport Hotel on the morning they start their walk, so it’s (probably) not going to be crowded with a whole pile of hikers tramping around the place, if that’s a concern. There’s no need to drive anywhere for dinner – the meals at the homestead are perfect and they use quality local ingredients. 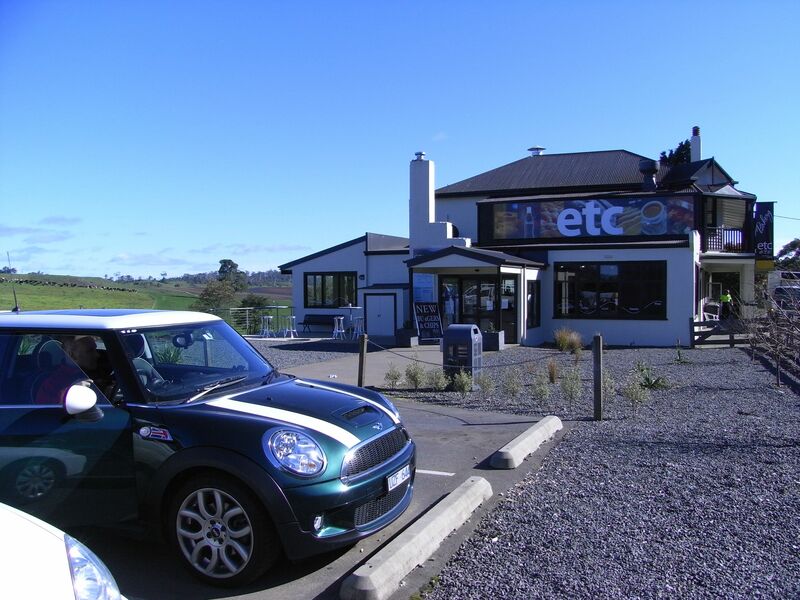 If you head west from Quamby, you’ll probably pass by ETC – Elizabeth Town Bakery Cafe. A very popular stop – open all hours for good hearty food, most of which is made in their on site bakery. It’s our preferred breakfast stop if we’re heading along the A1 towards Launceston or Hobart after disembarking from the Spirit of Tasmania. Not far up the road towards Devonport is Ashgrove Farm. We always stop there to buy cheese to take home and enjoy. There you can sample all their range of cheddar, buy an icecream made from their own milk, or even buy a litre or two of their milk if you fancy! They also sell other local produce, but it’s generally stuff that you can get elsewhere, like Anver fudge, Elderberry drink, Tasmanian Honey Company products etc. Snuggled not far away (nothing’s far away in Tassie), in the foothills of Mt Roland, is Sheffield which is famous for the many murals throughout the town. They have a mural competition each year, I believe. They are very good, and there are a lot! I have to admit though, we haven’t found a whole lot apart from the murals to hold our attention for too long. If you do need to stretch your legs at this point, check out World of Marbles; it’s on the main street next to the candy shop, from memory. The marbles there are absolutely awesome! Passing through Sheffield is the quickest way from Launceston (or Hagley) to Cradle Mountain – and as you’ll soon notice, the term ‘Cradle Mountain Country’ is used liberally in the north/north-west part of the state. Just as all signs up the east coast lead to Cressy, all signs in the N/NW lead to Cradle Mountain. Not too far from Sheffield to the south is Mole Creek. There are limestone and glow worm caves in the Mole Creek Karst National Park are definitely on our To Do List. But back to the north coast towns…. The A1 freeway that started in Hobart and made a beeline for Launceston up through the middle of the state, turns west and continues along the north coast… but now it changes to dual carriageway!! I think it’s the only dual carriageway highway in the whole state, so enjoy it! After you pass through La Trobe – the platypus capital of the world and the location of House of Anvers / Anvers Chocolate Factory (which we’ve never stopped at, but their fudge is famous and very, very good! ), you’ll come to Devonport. Depending on the time of the day and year, you may even get to see one of the two Spirit of Tasmania ferries in dock. There’s also a maritime museum, and lighthouse to admire. The next town along the coast that we’ve visited is Penguin. Small and quaint, and you’ll have to leave the highway to see and explore it, their Sunday market is pretty good. The bakery next to the public library is also really good and open nice and early for the hungry traveller. There is an unused railway that runs right along the coast, which is very pretty; it’s such a shame that they don’t have small tourist trains going along there. Blink and you’ll miss is – Somerset is a very small place, most notable as being where the turn off to the A10 is, which leads (as do all roads sooner or later) to Cradle Mountain. The B26 from Wynyard also meets up with the A10, but is mostly unsealed. We took the A10 to get to Cradle Mountain from Stanley – it’s an interesting drive. Wynyard is nice; in spring it is one of the main tulip growing areas. We thought we’s see more though – fields of colour as we drove around. Unfortunately that wasn’t the case. If you follow the signs to Table Cape (which can be seen for miles as you drive along the coast), you can visit a tulip farm (the only place we saw tulips being cultivated) or just check out the lighthouse. The last kilometre or so to the base of the lighthouse is dirt road, but the surface is pretty reasonable. There’s not much between Wynyard and Stanley. The places on the map are generally small beachside holiday spots that pretty much only locals know. Stanley is a sleepy seaside town that’s most famous for it’s Nut. If you don’t already know of it, trust me – it deserves the capital letter! It’s not a big town; one that relies heavily on people coming to town for a seaside holiday. There are a few places to stop for lunch, a couple of funky shops to check out and, of course, the Nut to climb or catch the chairlift up to the top. We haven’t been further west along the road than Stanley. Another region we haven’t visited in the W/NW of the state is the Tarkine, which is a region more than a specific place defined by set boundaries, such as a National Park would be. I think it’s the region south of the Arthur River and north of the Pieman River. It is a very special area and is definitely on our To Do List.